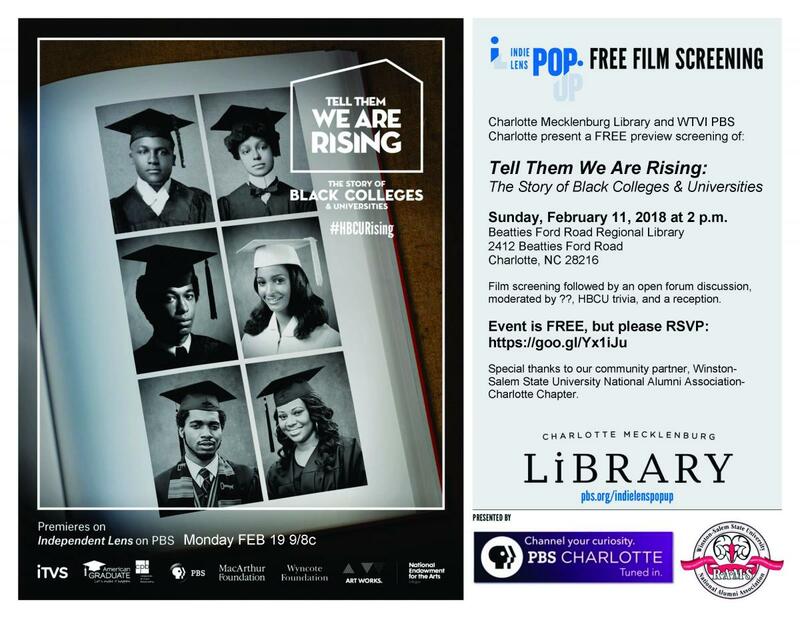 Charlotte Mecklenburg Library’s Beatties Ford Road Regional location is excited to host a FREE advance screening of Stanley Nelson’s Tell Them We Are Rising: The Story of Black Colleges and Universities on Sunday, February 11 from 2-4 p.m. The film explores the pivotal role historically black colleges and universities (HBCUs) have played over the course of 150 years in American history, culture and identity. It reveals the rich history of HBCUs and the power of higher education to transform lives and advance civil rights and equality in the face of injustice. These institutions have nurtured some of the most influential Americans of our time, from Booker T. Washington to Martin Luther King, Jr., W.E.B. Du Bois to Ralph Ellison, Toni Morrison to Oprah Winfrey, Alice Walker to Spike Lee. Beatties Ford Road Regional Library’s advance screening will play out like a homecoming celebration. While informational and educational at its core, the event will have multi-generational music, light refreshments, HBCU trivia and more. Join us Sunday, February 11 from 2-4 p.m. to acknowledge and celebrate African American History Month.